Members of the Sarawak women’s team do their warming up and training at the Sarawak Aquatic Centre yesterday. 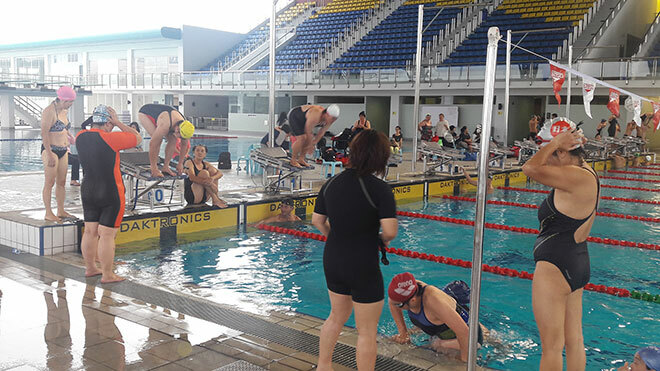 KUCHING: Sarawak are fielding the biggest number of 77 swimmers for their challenge in the Speedo Malaysia International Masters Swimming Championship at the Sarawak Aquatic Centre in Petra Jaya today. Among the swimmers in the line-up of Sarawak Amateur Masters SWAM Buaya are former Olympian 28-year old Daniel William Henry Bego and 13-gold medallist at Sukma III in 1990 Tania Hamid Bugo. More than 160 participants and officials from nine teams representing Singapore, Sri Lanka and Malaysia are involved in this championship, hosted by Sarawak for the first time. New Wave Swimming Club from Kuala Lumpur are also expected to throw a strong challenge in the one-day meet with 52 swimmers. Other teams are Chinese Swimming Club (Penang) who are sending six swimmers, Aquashark Swim Team (Penang) with four swimmers, Penang Swimming Club with three swimmers, Pusat Sukan Tumpuan (Penang) with two swimmers, Hong Kong Swordfish Club with four swimmers, Singapore Swimming Club with eight swimmers and Mahesh Karunnarathne Aquatics of Sri Lanka with five swimmers. The oldest participant is 74-year old Chong Ckok Moy from the Penang Swimming Club while the youngest participant is former Sarawak Sukma and national swimmer Angela Chieng, who is 20 years old and representing Pusat Sukan Tumpuan Penang.